To do a Master or MBA? Masters in Management is a postgraduate degree targeted for those who want to start a career in business management. You cannot get into a managerial position right after the completion of the course but can get into the management field. MBA is for people aiming at career development. It is aimed at people who usually have started their careers, need to bring in new knowledge, develop analysis tools, and networking opportunities to change their line of business or to meet the challenges of a promotion or to increase their career options. • MIM is a career start, hence applies for entry positions. 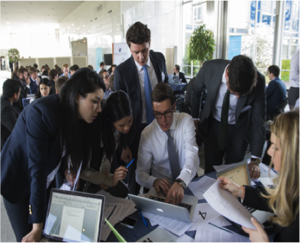 • The Master in Management (MiM)is a relatively young programme but is been rising in popularity all over the world. • A cheaper alternative, Masters in Management, the highest tuition fee for MIM goes up to EUR 30,000. • MBAs could cost up to EUR 70,000 in Europe. MIM programs are more flexible with a majority of colleges offering fast-paced 10 months course. MBA programs have a duration of 1-2 years. • MIM programs are targeted at people fresh out of university. • For an MBA the interview, essays and letters of recommendation are all vital parts of the application process. • GMAT is required for both courses. • Does not play a major role in MIM. • MBA requires a minimum of 2 to 3 years of professional experience. Many of the top-tier business schools require at least five years of work experience for MBA applications. How Much Would You Earn? • A fresher as a MIM graduate gets an entry-level job hence the salary is around EUR 55,000 or $50,000. • MBA graduates earn $100,000 due to their experience and knowledge. Looking for College counselling and guidance? Are you a high school student who’s always dreamed of attending a foreign university but didn’t know where to begin? Are you studying in college or a professional with a bachelor's degree thinking about furthering your education abroad? Are you a parent looking to help your child find their own path and discover their unique potential? Do you need an expert guide to assist you navigate the complex application process? Copyright © 2017 PPRO EED | Designed by Fluorescent Inc.